In order for a glacier to form, three conditions must be met. First, the local climate must be cold enough that winter snow does not melt entirely away during the summer. Second, there must be sufﬁcient snowfall for a large amount of snow to accumulate. And third, the slope of the surface on which the snow accumulates must be gentle enough that the snow does not slide away in avalanches, and must be protected enough that the snow doesn't blow away. Glaciers develop in polar regions because, even though relatively little snow falls today, temperatures remain so cold that most ice and snow survive all year. Glaciers develop in mountains, even at low latitudes, because temperature decreases with elevation; at high elevations, the mean temperature stays cold enough for ice and snow to survive all year. Since the temperature of a region depends on latitude, the speciﬁc elevation at which mountain glaciers form also depends on latitude. In Earth’s present-day climate, glaciers form only at elevations above 5 km at the equator, but can ﬂow down to sea level at latitudes of between 60 and 90 degrees. The transformation of snow to glacier ice takes place as younger snow progressively buries older snow. Freshly fallen snow consists of delicate hexagonal crystals with sharp points. The crystals do not ﬁt together tightly, so fresh snow contains about 90% air. With time, the points of the snowﬂakes become blunt because they either sublimate (evaporate directly into vapour) or melt, and the snow packs more tightly. As snow becomes buried, the weight of the overlying snow increases pressure, which causes remaining points of contact between snowﬂakes to melt. Gradually, the snow transforms into a packed granular material called ﬁrn, which contains only about 25% air (figure above d). Melting of ﬁrn grains at contact points produces water that crystallizes in the spaces between grains until eventually the ﬁrn transforms into a solid mass of glacial ice composed of interlocking ice crystals. Such glacial ice, which may still contain up to 20% air trapped in bubbles, tends to absorb red light and thus has a bluish colour. The transformation of fresh snow to glacier ice can take as little as tens of years in regions with abundant snowfall, or as long as thousands of years in regions with little snowfall. Glaciers are streams or sheets of recrystallized ice that stay frozen all year long and ﬂow under the inﬂuence of gravity. Today, they highlight coastal and mountain scenery in Alaska, the Cordillera of western North America, the Alps of Europe, the Southern Alps of New Zealand, the Himalayas of Asia, and the Andes of South America, and they cover most of Greenland and Antarctica. 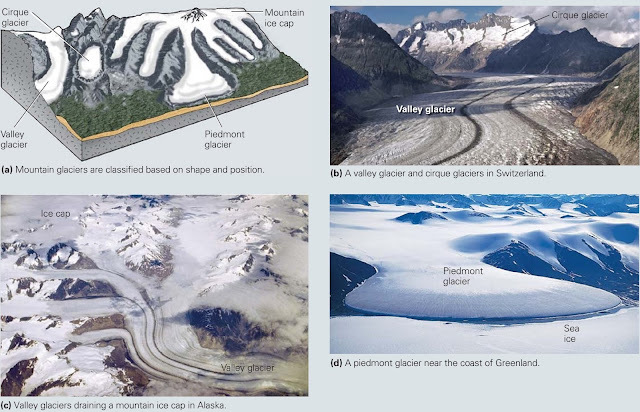 Geologists distinguish between two main categories: mountain glaciers and continental glaciers. A great variety of glaciers form in mountainous areas. Mountain glaciers (also called alpine glaciers) exist in or adjacent to mountainous regions (figure above a). Topographical features of the mountains control their shape; overall, mountain glaciers ﬂow from higher elevations to lower elevations. Mountain glaciers include cirque glaciers, which ﬁll bowl-shaped depressions, or cirques, on the ﬂank of a mountain; valley glaciers, rivers of ice that ﬂow down valleys; mountain ice caps, mounds of ice that submerge peaks and ridges at the crest of a mountain range; and piedmont glaciers, fans or lobes of ice that form where a valley glacier emerges from a valley and spreads out into the adjacent plain (figure above b–d). Mountain glaciers range in size from a few hundred meters to a few hundred kilometres long. Antarctica is an ice-covered continent. Continental glaciers are vast ice sheets that spread over thousands of square kilometres of continental crust. Continental glaciers now exist only on Antarctica and Greenland (figure above a, b). Antarctica is a continent, so the ice beneath the South Pole rests mostly on solid ground. Locally, however, lakes of liquid water exist at the base of continental glaciers. In 2012, Russian geologists drilled into one of these lakes, Lake Vostock, 3.7 km below the surface of the Antarctic ice sheet. Continental glaciers ﬂow outward from their thickest point (up to 3.5 km thick) and thin toward their margins, where they may be only a few hundred meters thick. Geologists also ﬁnd it valuable to distinguish between types of glaciers on the basis of the thermal conditions in which the glaciers exist. Temperate glaciers occur in regions where atmospheric temperatures become warm enough for the glacial ice to be at or near its melting temperature during part or all of the year. Polar glaciers occur in regions where atmospheric temperatures stay so cold all year long that the glacial ice remains below melting temperature throughout the year. Of note, Earth is not alone in hosting polar glaciers Mars has them too (read below). 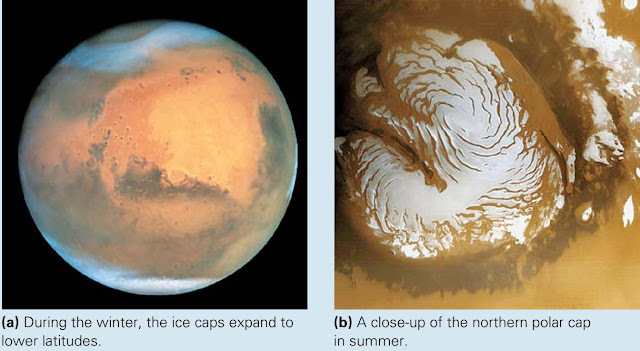 The ice caps of Mars. Mars has white polar ice caps that change in area with the season, suggesting that they partially melt and then refreeze (figure above a, b). 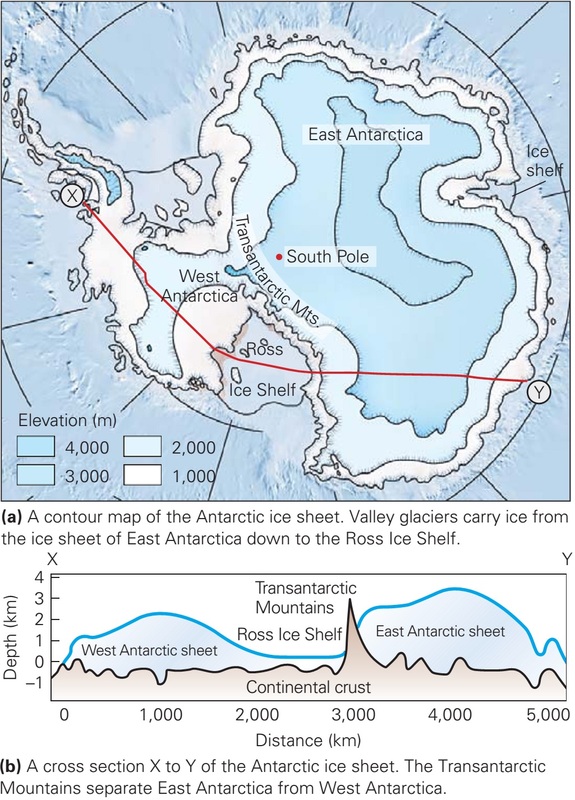 The question of what the ice caps consist of remained a puzzle until fairly recently. It now appears that the Martian ice caps consist mostly of water (H2O) ice mixed with a small amount of dust. The ice caps attain a maximum thickness of 3 km. During the winter, atmospheric carbon dioxide freezes and covers the north polar cap with a 1-m-thick layer of frozen CO2 (dry ice). During the summer, this layer melts away. The south polar cap has a dry-ice blanket that is 8 m thick and doesn't melt away entirely in the summer. The difference between the north and south poles may reﬂect elevation, for the south pole is 6 km higher and therefore remains colder. High-resolution photographs reveal that distinctive canyons, up to 10 km wide and 1 km deep, spiral outward from the centre of the north polar ice cap. Why did this pattern form? Recent calculations suggest that if the ice sublimates (transforms into gas) on the sunny side of a crack and refreezes on the shady side, the crack will migrate sideways over time. If the cracks migrate more slowly closer to the pole, where it’s colder, than they do farther away, they will naturally evolve into spirals. 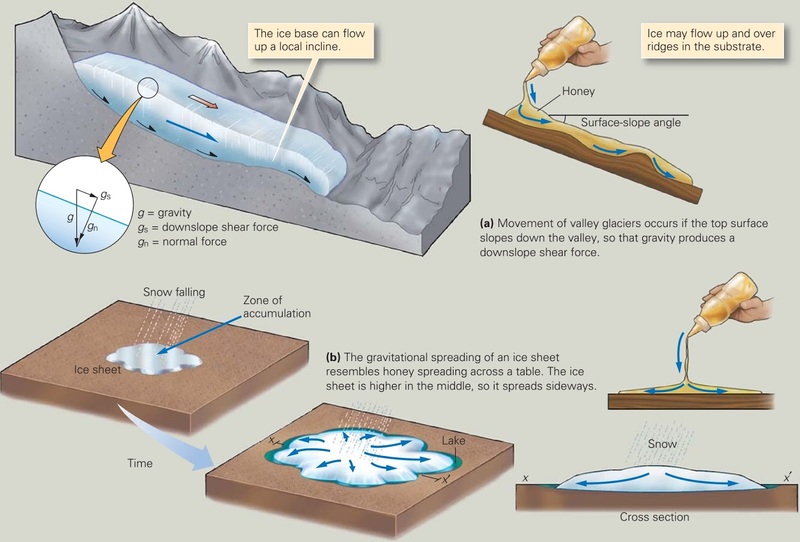 How do glaciers move? Let’s consider the two mechanisms that allow glaciers to move plastic deformation and basal sliding. At conditions found below depths of about 60 m in a glacier, ice deforms by plastic deformation, meaning that the grains within it change shape very slowly, and new grains grow while old ones disappear. We can picture such changes to be a consequence of the rearrangement of water molecules within ice grains. If ice is warm enough for thin water ﬁlms to form along grain boundaries, plastic deformation may also involve the microscopic slip of ice grains past their neighbours along the water ﬁlms. In cases where signiﬁcant quantities of meltwater accumulate at the base of a glacier, forming a layer either of liquid or of slurry like wet sediment, glaciers can move by basal sliding. During this process, the liquid water or water-saturated slurry layer holds the glacial ice above bedrock and thereby decreases friction; effectively, the glacier glides along on a wet cushion. Crevasses form in the upper layer of a glacier, in which the ice is brittle. Commonly, cracking takes place where the glacier bends while flowing over steps or ridges in its substrate. As we noted earlier, plastic deformation takes place only at depths of greater than about 60 m in a glacier above this depth, known as the brittle–plastic transition, ice is too brittle to ﬂow. As a glacier overall undergoes movement, its upper 60 m of ice deforms predominantly by cracking. 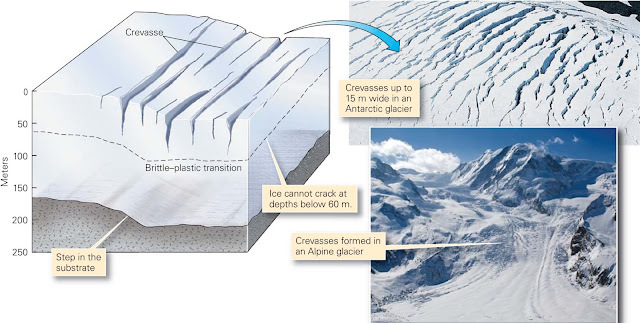 A crack that develops by brittle deformation of a glacier is called a crevasse (figure above). In large glaciers, crevasses can be hundreds of meters long, and they can open up to form open gashes up to 15 m across. Forces that drive the movement of glaciers. Why do glaciers move? Ultimately, because the pull of gravity is strong enough to make ice ﬂow (figure above a, b). A glacier ﬂows in the direction in which its top surface slopes. Thus, valley glaciers ﬂow down their valleys, and continental ice sheets spread outward from their thickest point. To picture the movement of a continental ice sheet, imagine pouring honey on a tabletop. The honey spreads out until the puddle reaches an even thickness. In the case of a continental ice sheet, a thick pile of ice builds up, and gravity causes the top of the pile to push down on the ice at the base. Eventually, the basal ice can no longer support the weight of the overlying ice and begins to deform plastically. When this happens, the basal ice starts squeezing out to the side, carrying the overlying ice with it. The greater the volume of ice that builds up, the wider the ice sheet can become. Flow velocities vary with location in a glacier. Overall, ice flows from the zone of accumulation to the zone of toe. Glaciers generally ﬂow at rates of between 10 and 300 m per year. Not all parts of a glacier move at the same rate. For example, friction between rock and ice slows a glacier, so the centre of a valley glacier moves faster than its margins, and the top of a glacier moves faster than its base (figure above a, b). If water builds up beneath a valley glacier to the point where it lifts the glacier off its substrate, basal sliding starts and the glacier undergoes a glacial surge. During surges, glaciers have been clocked at speeds of 10 to 110 m per day! Sudden surges may generate ice quakes, whose seismic vibrations travel through the glacier and through the rock below. 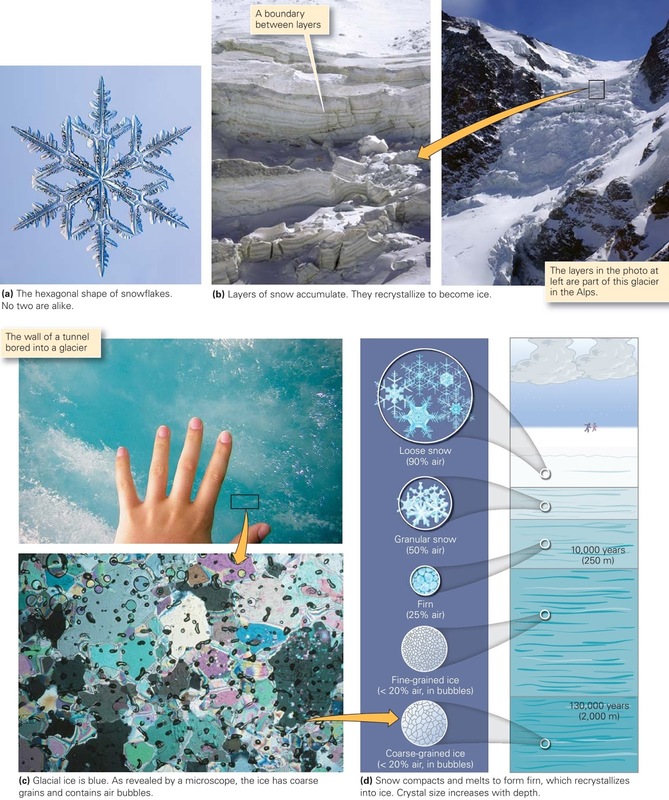 Glaciers resemble bank accounts: snowfall accumulates and adds to the account, while ablation the removal of ice by sublimation (the evaporation of ice into water vapour), melting (the transformation of ice into liquid water, which ﬂows away), and calving (the breaking off of chunks of ice) subtracts from the account. Snowfall adds to the glacier in the zone of accumulation, whereas ablation subtracts in the zone of ablation; the boundary between these two zones is the equilibrium line. The leading edge or margin of a glacier is called its toe, or terminus (figure above a). 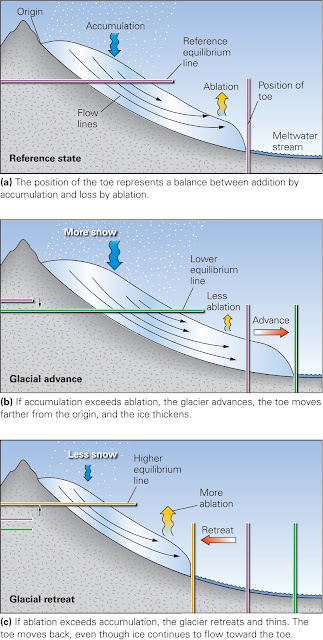 If the rate at which ice builds up in the zone of accumulation exceeds the rate at which ablation occurs below the equilibrium line, then the toe moves forward into previously unglaciated regions. Such a change is called a glacial advance (figure above b). In mountain glaciers, the position of a toe moves downslope during an advance, and in continental glaciers, the toe moves outward, away from the glacier’s origin. If the rate of ablation below the equilibrium line equals the rate of accumulation, then the position of the toe remains ﬁxed. 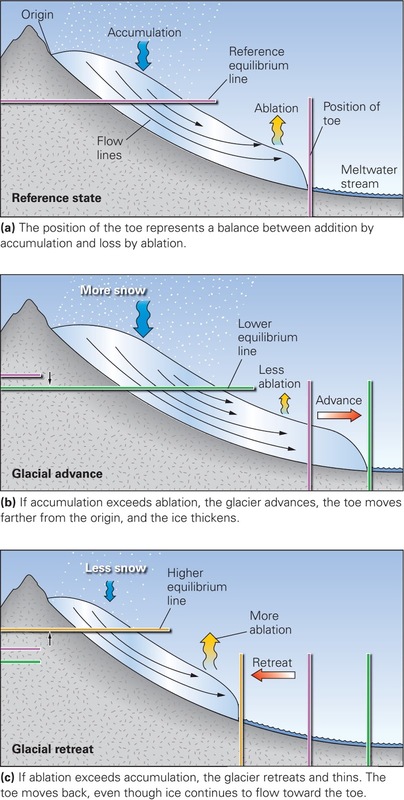 But if the rate of ablation exceeds the rate of accumulation, then the position of the toe moves back toward the origin of the glacier; such a change is called a glacial retreat (figure above c). During a mountain glacier’s retreat, the position of the toe moves upslope. It’s important to realize that when a glacier retreats, it’s only the position of the toe that moves back toward the origin, for ice continues to ﬂow toward the toe. Glacial ice cannot ﬂow back toward the glacier’s origin. One ﬁnal point before we leave the subject of glacial ﬂow: beneath the zone of accumulation, a volume of ice gradually moves down toward the base of the glacier as new ice accumulates above it, whereas beneath the zone of ablation, a volume of ice gradually moves up toward the surface of the glacier, as overlying ice ablates. Thus, as a glacier ﬂows, ice volumes follow curved trajectories (figure above a–c). For this reason, rocks picked up by ice at the base of the glacier may slowly move to the surface. On the moonless night of April 14, 1912, the great ocean liner Titanic struck a large iceberg in the frigid North Atlantic. Lookouts had seen the ghostly mass of frozen water only minutes earlier and had alerted the ship’s pilot, but the ship had been unable to turn fast enough to avoid disaster. The force of the blow split the steel hull, allowing water to gush in. Less than 3 hours later, the ship disappeared beneath the surface, and 1,500 people perished. Ice shelves, tidewater glaciers, and sea ice, the nature of coastal areas in glacial regions. Where do icebergs, such as the one responsible for the Titanic’s demise, originate? In high latitudes, mountain glaciers and continental ice sheets ﬂow down to the sea, and they either stop at the shore or ﬂow into the sea. Glaciers whose terminus lies in the water are called tidewater glaciers. Valley glaciers may protrude farther into the ocean to become ice tongues. Continental glaciers entering the sea become broad, ﬂat sheets known as ice shelves. In shallow water, glacial ice remains grounded (figure above a). But where the water becomes deep enough, the ice ﬂoats with four-ﬁfths of the ice below the water’s surface. At the boundary between glacier and ocean, blocks of ice calve off and tumble into the water with an impressive splash. If a free-ﬂoating chunk rises 6 m above the water and is at least 15 m long, it is formally called an iceberg. 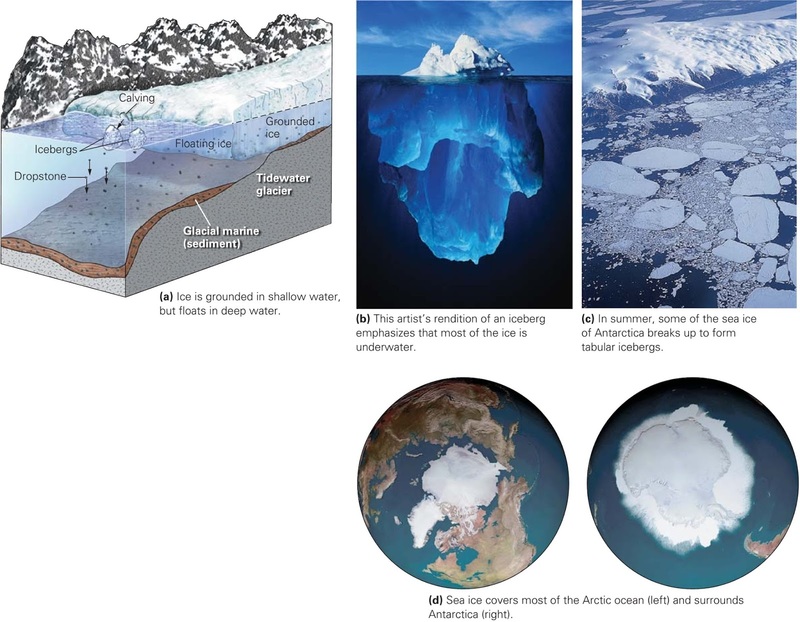 Since four-ﬁfths of the ice lies below the surface of the sea, the base of a large iceberg may actually be a few hundred meters below the surface (figure above b, c). Not all ice ﬂoating in the sea originates as glaciers on land. In polar climates, the surface of the sea itself freezes, forming sea ice (figure above d). The north polar ice cap of the Earth consists of sea ice, formed on the surface of the Arctic Ocean. Some sea ice, such as that covering the interior of the Arctic Ocean, ﬂoats freely; but some protrudes outward from the shore. Vast areas of ice shelves and of sea ice have been disintegrating in recent years. For example, ice-free openings develop in the Arctic Ocean sea ice during the summers, and the area of the ice shelf in Antarctica has been decreasing rapidly.